The tongue of a horse with vesicular stomatitis. 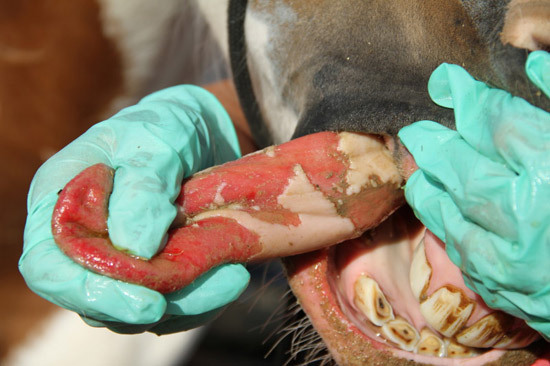 Two cases of vesicular stomatitis have been confirmed in horses in Arizona. The state’s agriculture department has issued guidance to organisers of horse events following the confirmation of the cases. Three properties in Santa Cruz have been quarantined. The cases come less than two weeks after an outbreak centered on Colorado and Texas was officially declared over by federal authorities to the World Organisation for Animal Health (OIE). Vesiclar stomatitis is a contagious virus that causes blister-like sores on the mouths, noses and sometimes feet of infected animals. State authorities said one animal was moved to its owner’s nearby property before the formal investigation, resulting in three properties and all the animals on them being placed under quarantine. “Vesicular stomatitis virus mainly affects equine and to a lesser extent cattle and swine,” state veterinarian Perry Durham said. The blisters are most likely to affect the mouth, the tongue and around the nose/muzzle. They can be painful, causing difficulty in eating and drinking. If cattle are infected, often the hooves and teats are involved, leading to severe economic impact in dairy cattle. This also generates worries because the disease is basically indistinguishable without testing from foot and mouth disease in cattle. The horses involved have no history of travel. Other livestock on the premises have shown no signs of disease to date. A US Department of Agriculture official initially investigated and then brought the state agricultue department into the investigation. The assessment of the situation is ongoing to detect and prevent further spread. Veterinarians and livestock owners who suspect an animal may have the disease should immediately contact state or federal animal health authorities. Livestock with clinical signs of vesicular stomatitis are isolated until they are healed and determined to be of no further threat for disease spread. There are no federally approved vaccines for the disease. People can be infected with the virus, although it is rare. In these situations, it is usually among those who handle infected animals – for example, while inspecting a horse’s mouth and the horse coughs in the person’s face, delivering a large dose of virus onto the person’s eyes and lips. It can cause flu-like symptoms in people, but only rarely includes lesions or blisters. Colorado authorities said organisers of livestock events or exhibitions may wish to institute new entry requirements based on the Arizona cases. They noted, too, that several properties in Colorado remained under quarantine. Positive premises are not eligible for quarantine release until 21 days after lesions have healed in all affected animals. The agriculture department said requiring that certificates of veterinary inspection be issued within 2-5 days before an event can reduce the risk of importing not only the vesicular stomatitis virus but other diseases such as equine herpes virus. “A window of risk still exists that cannot be completely eliminated, given that the usual incubation period for VSV ranges from 2-8 days,” the department said in a statement. “Another option to consider would be to have all entries examined by a veterinarian prior to unloading on the grounds. No doubt the logistics would be a challenge. The Arizona cases are included in the latest update from the Animal and Plant Health Inspection Service (APHIS), a division of the US Department of Agriculture. The January 7 situation report confirms that the Arizona cases are of the New Jersey serotype. The two infected horses would be considered the index case for Arizona, APHIS said. The report noted that 11 properties in Colorado remained under quarantine, across Adams, Elbert, El Paso, Fremont, Morgan and Otero counties. No new cases have been reported in Colorado, Texas, or Nebraska, which had had four cases in cattle at one property, since early December. In all, 433 premises were affected in the outbreak in the three states, with 370 of them in Colorado, 62 of them in Texas and the one in Nebraska. A total of 644 horses and cattle were affected. In all, 584 horses were infected, all of them in either Colorado (495) or Texas (89). Colorado had 48 cases involving cattle and Texas had 8. Is the quarantine lifted yet? Are horses immune to VSV once they have had it?